LONDON (Reuters) - European shares sank on Thursday after the arrest of a top executive at China's Huawei fanned worries over the Sino-U.S. trade war, sending global stocks spiralling downward with tech and auto among the worst-hit areas. Huawei's CFO, Meng Wanzhou, was arrested in Canada and faced extradition to the United States, a development that cast doubt on a 90-day truce on trade struck between presidents Donald Trump and Xi Jinping on Saturday. The pan-European STOXX 600 (.STOXX) plunged 3.1 percent to its lowest level since December 2016. The index suffered its worst one-day fall since the Brexit vote aftermath of June 2016. 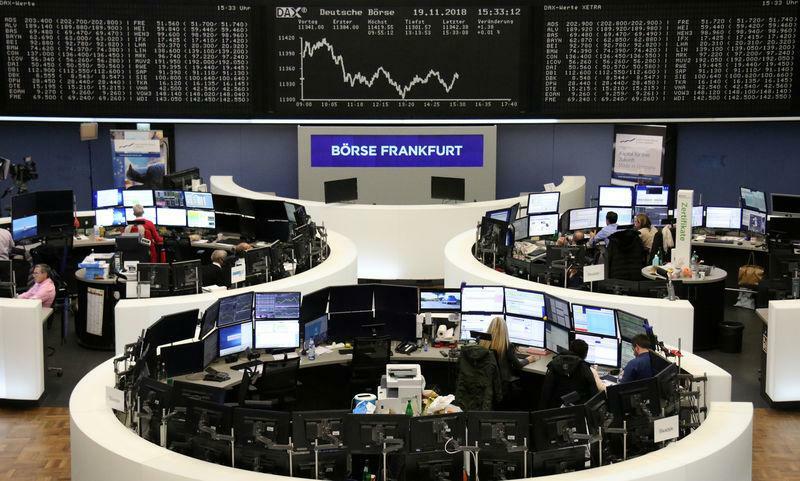 European shares were slumping for their third day in a row, after dropping earlier this week on concern over an economic slowdown in the United States. "I do believe people are thinking about the U.S.-China trade dynamic too narrowly," said Norman Villamin, chief investment officer at Union Bancaire Privée. "It's not about trade - it's about who is going to be the economic and political leader of the world in 10-20 years from now. It's about tech, and who is going to dominate that landscape," he added. Germany's export-oriented DAX (.GDAX) index, which has been weakened by concerns that trade tensions would curb growth in China's economy, slid 3.5 percent to hit a two-year low. Auto stocks (.SXAP) were the biggest fallers, plunging 4.2 percent to their lowest since July 2016, led by a 7.3 percent fall in tyre maker Faurecia (EPED.PA) and a 6.3 percent drop in German carmaker Daimler (DAIGn.DE). Tech (.SX8P) shares tumbled 3.1 percent. Huawei supplier STMicro (STM.MI) lost 4.7 percent, AMS (AMS.S) sank 10.7 percent and Dialog Semi (DLGS.DE) fell 4.2 percent. Ericsson (ERICb.ST) and Nokia (NOKIA.HE), rivals of Huawei, outperformed as traders calculated they might gain from potential U.S. crackdown on the Chinese firm. "These tactics could effectively create a duopoly in the Western markets for Ericsson and Nokia for 5G," said Neil Campling, co-head of the global thematic group at Mirabaud Securities. A Wall Street Journal report last month said the U.S. government was trying to persuade wireless and internet providers in allied countries to avoid equipment from Huawei. BT (BT.L) said on Wednesday it was removing Huawei equipment from the core of its 3G and 4G mobile operations and would not use the Chinese firm in central parts of the next network. "This is going to be the epicentre of a bloody IP war," said a trader. Denmark's Simcorp (SIM.CO) was the only tech stock in the black, rising 6 percent after it announced an 8-year licence agreement with an Asian investment company. Indivior (INDV.L) shares skidded 11.4 percent, the worst-performing on the STOXX, after STOXX Ltd announced it would be demoted from the index. In France, shares that had been hit by recent protest over fuel-tax plans, such as retailer Carrefour (CARR.PA), motorway operator Vinci (SGEF.PA) and hotel group Accor (ACCP.PA), fell 3.5 to 4.9 percent. President Emmanuel Macron's government said on Wednesday it was dropping further fuel-tax increases in next year's budget in the face of protests across the country. Oil stocks (.SXEP) lost 3.7 percent as crude oil prices fell after OPEC ended a key meeting having made no decision on crude output. No sector in Europe was spared from the selloff, but the outperformers were those considered "defensive" for their high dividends and stable earnings, like telecoms, utilities, and real estate stocks.